Hotel phones - why do we take them for granted? Hotel phones – why do we take them for granted? It’s funny how we check into a hotel or motel, go to our rooms, unpack our bags, take a shower, get dressed for dinner or a night on the town or just hunker down for the night, we make a few phone calls – home, for business, or simply to call for a cab – maybe even just to call the front desk to find out where the nearest ice machine is – and yet, despite the fact we recognize the distinctly different design of a hotel phone, we just kind of take the poor thing for granted! When you want a pizza haven’t you ever taken the time to notice how the hotel has already taken the time to label your room phone faceplate with a pizza button (or at least room service key)? Tsk, tsk! The fact is that hotel/motel guest room phones are very different from your average business phone system extension – despite the fact the main system control unit of the phone system may be the same (i.e. 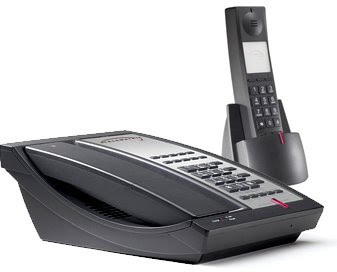 Avaya IP Office, Avaya Definity, Nortel Norstar, Nortel Meridian 1 PBX for larger hospitality properties). The hotel room phone is very much it’s own breed and major manufacturers include Teledex hotel phones, Scitec hotel phones, and Telematrix hotel phones. HOTELtelecom specializes in offering hotel and motel chains and individual hotels and motels direct online hotel phones at wholesale prices. 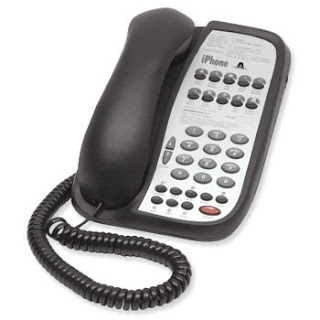 Today hotel phone stretch into the VoIP category and many lines are now far more stylish than the traditional looking phones that have always been very functional for it’s designed purpose but packaged in a plain rectangle shape. The new iPhone A line from Teledex is a very good example of the new euro styling being employed by hotel phone manufacturers. While traditional hotel phones were usually beige (cream) color, the iPhone A line base color is charcoal (black) color. Personally I think this is a huge improvement over the older stying of guest room phones. In case you didn’t know (as we all chose to simply ignore the phones in all the hotel or motel rooms we have stayed in – lol) Teledex is considered the world’s leading manufacturer of hospitality phones. Another major development over the past 10-12 years are short range cordless phones that are specifically made for hotel rooms. The short range feature of these phones means no interference or cross-talk between the cordless phones between each of the rooms in a property. These phones also have come a long way in styling as evident with the new Telematrix cordless hotel phones which feature single line and 2-line versions. One thing is for sure the technology behind guest room phones has come a long way and even those most brand lines remain analog phones, the digital improvements to set features are vastly improved. Improvements in the cordless versions of these phones include DECT 6.0 technology and use of the newer 1.9 GHz bandwidth. Has the time come where we will now revere hotel/motel room phones instead of simply taking them for granted? Probably not. But it does occur to me that me may finally take more notice of them and understand that they have very unique qualities when compared to the average business phone. Maybe we will even come to appreciate these phones as the really marvelous sector of the telephony industry they represent – even if only because the “Pizza” button saved you an ill-fated trip through the local phone book in a city you know nothing about. Cheers all! This entry was posted in Avaya, Avaya Definity, Avaya IP Office, cordless hotel phone, guest room phone, hotel, hotel phones, motel, motel phones, Nortel Meridian, Nortel Norstar, room phone, Scitec, Teledex, Telematrix on July 10, 2009 by jjackson.